Bladder Cancer - body, Keyword, Smoking and Bladder Cancer?, What Is Bladder Cancer? Bladder cancer occurs when cells in the bladder, the muscular sac that stores urine, divide without control or order. Bladder cancer sometimes spreads to other parts of the body. Cigarette smoking is most commonly associated with lung cancer, but smokers also are two to three times more likely than nonsmokers to develop bladder cancer. Cigarette smoke contains harmful cancer-causing chemicals called carcinogens (kar-SIN-o-jenz). People can greatly reduce their risk for bladder cancer by quitting smoking or not starting in the first place. Some factories and industrial plants release chemical carcinogens, which may explain why bladder cancer is more common in urban areas than rural. Exposure to certain kinds of chemicals at work also appears to increase risk. This includes people who work in the rubber, chemical, and leather industries, as well as hairdressers, machinists, metal workers, printers, painters, dry cleaners, textile workers, and truck drivers. That does not mean that most of these workers will develop cancer. In fact, most will not. However, they should be aware of their risk and take precautions to decrease their exposure to chemical carcinogens. In many cases, though, bladder cancer seems to develop without an apparent specific cause. The bladder is the hollow muscular sac in the lower abdomen that stores urine, the waste produced when the kidneys filter the blood. Cancer usually begins when cells on the surface of the bladder wall begin dividing without control or order, forming a growth called a tumor. Over time, this tumor can grow through the bladder wall and spread to nearby organs. Each year, nearly 55,000 Americans learn that they have bladder cancer. It is one of the ten most common forms of cancer, affecting men twice as often as women and usually occurring between ages 50 and 70. The bladder is the hollow muscular sac in the lower abdomen that stores urine, which is the waste produced when the kidneys filter the blood. Early symptoms typically include blood in the urine and frequent or painful urination. However, these symptoms also may be caused by other conditions, so it is important to have them checked by a doctor. When doctors want to evaluate someone for bladder cancer, they usually perform a physical exam and test a urine sample to check for blood and cancer cells. They also can insert a thin, lighted tube called a cystoscope (SIS-to-skope) through the urethra * to examine the lining of the bladder. If they suspect cancer, they perform a biopsy by removing a tissue sample through the tube and sending the sample to be examined under a microscope. The appearance of the cells indicates whether or not cancer is present. 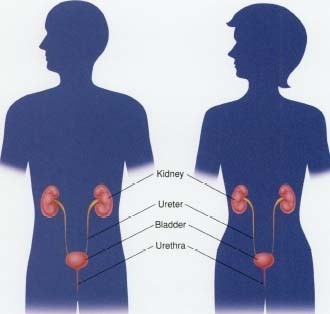 * urethra is the tube through which urine is discharged from the bladder to the outside of the body. Intravenous pyelogram (IVP): This is a series of x-rays of the kidneys and bladder taken after a dye is injected into a vein. CT scans: Also called computerized tomography scans, these are series of detailed pictures of areas inside the body created by a computer linked to an x-ray machine. MRIs: Magnetic resonance images are created through a procedure that uses a large magnet linked to a computer to create detailed pictures of areas inside the body. Ultrasound: These images are created by bouncing sound waves off tissues inside the body and converting the echoes into pictures. The usual treatments for bladder cancer are surgery, radiation therapy, chemotherapy, biological therapy, or a combination of them. This usually depends upon how much of the bladder is involved and whether or not the cancer has spread to other parts of the body. In almost all cases, a surgeon will remove tumors and any surrounding tissue that is affected. If the tumors are only on the surface of the bladder wall, the doctor can insert a tool with a small wire loop on the end through the urethra and burn them away with an electric current, a process called fulguration (ful-gu-RAY-shun). If the cancer has grown into or through the muscular wall, part or all of the organ is removed in a procedure called cystectomy (sis-TEK-to-mee). Sometimes, nearby reproductive organs need to be removed as well. Radiation therapy is another common treatment for bladder cancer. Internal radiation involves placing a small container of radioactive material, called a radiation implant, directly into the bladder to destroy the cancer cells. Radiation also can come from a machine outside the body that focuses high-energy rays on the affected area to kill cancer cells. Sometimes radiation is given before or after surgery, or along with anticancer drugs called chemotherapy. Biological therapy, also known as immunotherapy, is a form of treatment that attempts to trigger the body's own disease-fighting immune system against the cancer. People who have part or all of the bladder removed often have to make some adjustments in their activities of daily living. When people lose just part of the bladder, they may find that they need to go to the bathroom more frequently. When the entire bladder is taken out, they have to learn a new way of emptying the urine from their bodies. Upon removing the bladder, surgeons construct a new passageway to take over the bladder's function in a procedure called a urostomy. They might use a piece of the small intestine to create a tube that carries the urine to an opening in the stomach area, called a stoma, where it is collected in an attached bag. The patient must empty the bag periodically. A newer method uses part of the small intestine to make a new storage pouch inside the body, collecting the urine there instead of emptying it into a bag. Patients learn to use a tube called a catheter to drain the urine through either a stoma or the urethra. Special therapists work with bladder cancer patients to teach them to care for themselves and their stomas after surgery. They can answer questions, address emotional and physical concerns, and suggest sources of additional information about urostomy. People who have a urostomy usually can resume all the activities they enjoyed before the operation. U.S. National Cancer Institute (NCI). NCI is one of the National Institutes of Health. It posts a fact sheet called What You Need to Know about Bladder Cancer at its website. American Cancer Society Cancer Resource Center. Information is available from ACS by telephone or online. American Foundation for Urologic Disease, 1126 North Charles Street, Baltimore, MD 21201. The American Foundation for Urologic Disease publishes Family Urology Magazine.